via internet and via YOU too! Answering - responding is OPEN TO EVERYONE. I am asking a Question every week. and posing a new Question every Sunday. We all have Abilities and Disabilities. Not just the stereo typical physical or mental visible ones. I will answer first as I always do - followed by everyone who has responded to date. One of my many disabilities is my spelling and grammar AND I don’t know the alphabet.. I get by via spellchecker. has led me to developing more interactive creative methods. I have lived with this all my life but still feel the shame. Ability - I think I am a warm person with empathy which helps me to build a climate of trust in relationships. I have chosen these two because I feel most inadequate with this disability and my relationships are of vital important to me. I'd say my disability is in trying to read other people's moods, expressions and emotions and getting things wrong! I struggle to deal with other people's emotional behaviour, I like things to be balanced and level and unfortunately most people's lives are messy and broken and I do feel helpless. My biggest ability is my gift with kids, I am fortunate to have a fantastic job where I work with kids, I love the spirit and individuality and independence kids have, I feel comfortable and capable and we have great fun and a great bond. My disability is my bad short term memory and my ability is I can read people, and I can relate communicate and empathise with people, I chose these because the disability is something that has happened recently and is causing anxiety in me and I am having to find ways to cope with it, also sharing it lessens the fear. I chose the ability because this has served me very well over the years and is a great asset to me that has stood me in good stead and has become stronger over the years. My greatest disability I would say is still believing the negative messages I have received about myself over the years and which are very deep rooted. No matter how hard it is to try and shake them off they niggle away at me and it takes nothing much for them to leap straight to the forefront of my mind to the exclusion of all reason. This is very disabling - and I chose to share because I believe it is something that affects many people. It’s also why I believe it is so important to focus on people’s abilities and strengths and build on the positives. One Ability: I'm learning later in life than I probably should have, how to put my own interests second to the needs and interests of others. My Disability is that still too often when I do this, I only carry it off with reluctance or resentment. My biggest ability is also my biggest disability. I love people. In my work with EBSD children, I am getting very involved with them and their emotional state. They progress and blossom, but my working out off the box also often gets me into trouble and wears me out. And whenever there are too many of them needing me or something from me, i stretch until i break. One of my disabilities is a very real inability to hold verbal information in my mind for any length of time, unless i have seen it written down. It causes a lot of bother in daily living. One ability is that i am very intrigued about other people. Lots of people want to talk either about themselves or about what they do, opinions, choices, friends, family, feelings, furys…. I have chosen both of these because i am person who exists in a world right up alongside with other people. Sadly the disability causes frustration to others whilst i can only hope that the ability might help me to be a better listener. Maybe they balance each other out…. The disability is most definitely clinical depression. I am on daily medication for this and have been since the nineties. It was poo poo’d for many years by doctors and I was left without any support. It was a struggle to keep my head above the water of life. Of course I blamed myself for having dark episodes in my life. Once it was diagnosed I realised how I could try and tackle the symptoms. The experience has been part of the journey in walking besides others through their dark periods. People who are hurting trust me because they know I won’t judge or condemn them, nor will I be superficial and come out with a “verse” for every occasion! It has taught me to actively listen with my mind, my heart and my being. I can sing unaccompanied and have done recordings in the past. My dad told me that I could sing before I could speak. I can write and compose, songs & poetry. have presented papers on Children’s Spirituality & Being Alongside those in trauma. as well as Art Reprobates! It’s even been said that I was good and born communicator. I’ll let others decide on that one. It would seem that I can also make people laugh a lot with my ready banter & sometime wit. I love to see people smile and laugh heartily. My ability and disability lie in exactly the same place. My thinking space – which I don’t believe all just happens in the brain. I have the ability to come up with ideas, imaginative thinking, positive dreams and visions. and so I end up never do anything with the positive ideas. I have the ability to love the unlovely. I have sat in prison cells and listened to another human being’s story whose crimes would be repulsive to others. I cry a lot when reading the stories of the broken, excluded and down trodden. And those who make vast amounts of money from wars and violence. Oh - another interesting one. Is there a difference between learned abilities and natural ones? Why ask that - well when I was younger I was very good at learning things quickly, especially maths & science, which made many exams a breeze for me - but in some ways thats also a disability because it’s not something other kids are too keen on that & some teachers wonder if you are cheating & that they just can't prove. Learnt one, I'm far more capable of emphathy now with people - but also in a way that keeps a little safe space between you and them. Disability - many would probably disagree with this, but being a shortarse as so many of my friends have cheerfully called me over the years. Girls probably find it a little easier in being thought cute - I'd worry if anyone ever thought of me in that way. It has an impact on many things, not just the obvious like not always being able to see at standing gigs, for a while in the local theatre until they changed their seating layout for a really good thing I'd get two tickets, the one where I was sitting and the seat in front of that to make sure I had a decent view. Then there's shopping for shoes - my wife dreads it when I decide to look for shoes, why? Because I'm a five and a half which basically means I'm looking for a small 6 in mens shoes. You try looking for those! Hours of fun! My biggest disability is trying to please everyone and becoming paranoid when I think someone might be saying something about me. My ability is to make people smile everyday and know deep down that I am loved and respected by my family and work colleagues. I'm told that one of my abilities is the ability to listen and empathise with people. I'm definitely a people person and I love that. The thing that disables me most is anxiety. I struggled for a long time with depression and still take a low-dose medication to remain stable. Under stress, it's sometimes hard to remember the reality of a situation and I can fall back into believing feelings which tend to be unreliable! One of my Abilities is to be spontaneous. To improvise. To be creative. I seem to flourish in situations like these. I love the adrenalin. I love to be contagious to other people. I develop a lot of power, love and passion then. But bright and dark lie close together. There is always a little “curse” in our blessings. And vice versa. I guess my Disablitlity is related with this Ability somehow. It´s doing routine-jobs. I´ve got big problems to do some important work at the office in time. Application forms, invoices, documentations. That causes a lot of stress in my life. I choose these, because they have big influence in my daily life and because I work on these topics for myself all the time. I learned a lot, sometimes it was painful. I´m still trying to keep a healthy balance. I'd say my disability is my sensitivity, being a highly sensitive person. It means that I can take on board others feelings and get pulled downwards when those around me are stressed or suffering. It means my own mood can be affected by those around me, and that I can take on stress that is not my own. Being highly sensitive can also mean that I get hurt quickly, and can overthink things! However this is also an ability, being sensitive means I can notice when others are experiencing different feelings, when people are saying something which is not consistent with how they are feeling. It means I have a heightened level of empathy with others, and can understand how others are impacted by different issues. It took me a while to work out how to make a disability into an ability, but I'm glad I have!! Ability: To listen and to understand with great empathy those who confide in me, to support and encourage and show love to others from any background, race or faith and be a consistent rock if necessary. Honouring and respecting the trust placed in me. 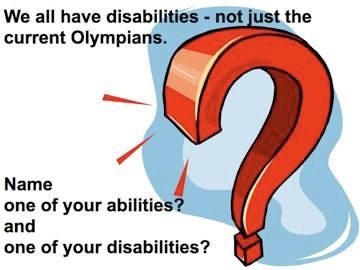 Disability: Many, but from my perspective the greatest (not least because it would almost certainly help resolve many of the others) is the fact that I have no one who could do the same for me. Sometimes being "strong" is hard and I do wish that I had someone to talk to the way that many talk to me. Not having anyone in my life that is able to do the same for me. Disability - I think I can be impatient and that diminishes my best ability, to see the amazing gifts and talents and possibilities in others as people are such a blessing if I choose to look. My beautiful wife has MS which means we have had to completely change everything I have to serve her abilities so her physical disabilities don't become the defining thing and so there is good in everything. My ability: I have the ability to make people feel welcome and safe when I meet them. It is a part of me. Natural. It comes from my parents, especially my father. My disability right now: Controlling the anger inside me because I don't think before I act. I was always happy go lucky and never let things bother me. I guess I am passive agressive as I hate conflict. I am a peacemaker. Well now as I enter the menopausal stage of my life and dealing with my parents' illnesses and stress at work I am allowing my anger to get the better of me and blurt out words before I think. Well, I have many, I suppose. I can't roller skate or do math very well. I am inconsistent with time and am continually over-optimistic with my expectations of what I can accomplish. But, I'd have to say the disability that affects me the most in my daily life is my difficulty in understanding that other people are willing, able and ready to help me in astounding ways. I get caught up in the notion that I have to do "all this", whatever that happens to be, by myself when the reality is that I am surrounded by wonderful people and world that conspires to help in unexpected ways. I am open to it, allow it, receive it when I am able to do so. It's not the lack of help that isolates me. I have an ability to imagine possibilities and potentials. I have a visions and ideals that I'm happy to work for. I enjoy helping others imagine their potentials and possibilities and helping them work for theirs. I shared these because I'm very aware of my disability this week. Got myself into a painful place again because of it. And the ability is what drives me forward, but I can suffer in the experience of potential and possibility when I don't invite others to come and join me in the work. So, these two go together for me. Ability - I am very principled. I don't break my principles for anything. This means I sometimes suffer difficult times and people may perceive me as too stringent..but I don't break them for anything. Disability - I am not good at consoling people who have suffered bereavement. I never know what to do. Shall I say something or is that patronising? Shall I stay quiet or is that showing I don't care? My disability is an over-eagerness to do things for others, I find it very difficult to say no to people and often helping people comes at a financial cost to my business or a cost to my own time that I can’t afford when I'm really busy. My ability however is pretty much the same thing, people trust me and confide in me, they run business ideas past me for an honest appraisal, I'm privy to confidences about broken marriages and affairs, financial problems and a whole host of other things. I listen, I observe and I don't judge which is why helping others is both an ability and a disability. It's nice to be wanted and needed, all of us need some validation but the problem is knowing when to say no. I have obvious conditions that people at first glance would call disabilities. Such as my Dysmelia, a bone deficiency diagnosis in my right arm, and a genetic lack of teeth in my jaw. These are purely physical. But they are not, as stated earlier, necessarily disabilities to me. Well, I could have done without the missing teeth, but there you go. My right hand is my superpower, because through all my dabbling with self loathing and body shame, and various baggage that has been inflicted upon me, that has been one constant thing that I was never once ashamed of. It's only a trifle compared to an enormous amount of other physical conditions in the world, but it has given me the ability to think creatively to solve every day problems, to see aesthetics in asymmetry and lopsidedness, and it has continuously kept me vulnerable, which I realise now is a strength of mine. I am able to empathise and identify. Ever since I was a child, a strong instinct, thanks to my mother never telling me that I couldn't do what others could, was that I could do it too. I would do it too. And I'm regaining the unwillingness to give up little by little. - Well, I couldn't do cart wheels, and my math skills are regrettable at best, but again, there you go. Oh yes, and I'm good with words. My disability - I think - is my tendency towards isolation when my energy levels plummet, as they do. And my tendency to inflict blame upon myself, and to blame my isolation on my loss of energy and give up, instead of standing up to the fear that I won't be good enough if I participate because I am so exhausted. My exhaustion merely enhances my low self image, and my fear that I won't be good enough. This circle is my most disabling disability. these beautiful authentic sharing of Abilities and Disabilities. or any others - please read the guide and I encourage you with passion. There is a purpose in this experience. and all if they read & reflect themselves. can not be touched deeply. 2) YOUR Answers/reflections won't fit easily into a Tweet or Facebook because of confidentiality. C) Private for Pip ONLY ………………….. because I want to PUBLISH everyone's answers to all my questions on my website to stimulate imagination and feed others..
6) Please consider sharing these ANSWERS/questions on social media to encourage participation. SHARE / RETWEET etc.